In 1949, through a short essay published in the Reader's Digest, Alfred Lilienthal gave a sharp, uncompromising warning. Hot on the heels of the creation of the new State of Israel, while many of his fellow American Jews were still celebrating, he wrote that: "fanatical Jewish nationalism [has] weakened the moral and spiritual stature of the world's oldest religion" [its aggressive supporters] are doing the Jews more harm than any words which Goebbels spoke" . Until his recent death in 2008, Lilienthal was harshly derided for those words, and the many other anti-Zionist sentiments that sprung from his pen to follow them. Author Manfred Gerstenfeld called him a "hard-core extremist" ; by Canadian professor Alan Davies' reckoning, he was "useful" to anti-Semites . Yet in recent years, many of his views have found an unlikely foothold in the Left. For example, nestled within a lengthy piece published in the Independent last week, Peter Schwarz predicted grimly that "Israel will destroy Judaism" . The irony of this sentiment will be lost on no one, particularly as the chief justification for Israel's ongoing 'Operation Protective Edge' is 'self-defense'. By this, the state so desperate to maintain its Jewish identity of course means the defense of the Jewish people as a whole, as well as its actual citizens. After all, the historic purpose of the State of Israel was to offer a safe haven to the world Jewry. In protecting itself the state tacitly takes up arms for the defense of Jews all around the globe, by continuing to offer this long-oppressed people an impregnable refuge -- according to Zionist rhetoric, anyway. Regardless, the idea that Israel is more of a danger to the Jewish people than a sanctuary is a deeply disturbing one that invites outrage and confusion. Yet the recent spike in anti-Semitic violence and threats, coinciding with the current war and often masquerading as legitimate protest against it, suggests there is a great deal of truth in that theory. 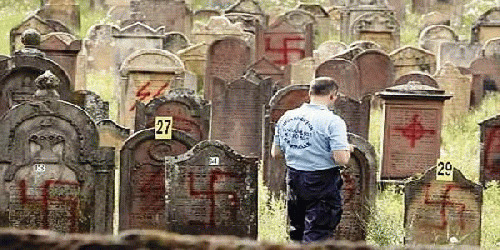 While the riots in Sarcelles, France have led to calls for the Jewish Defense League, the organization responsible for the demonstrations, to be banned and many related protests cancelled, predominantly Jewish areas of Manchester (UK) have been accosted by thugs throwing eggs and chanting "Heil Hitler". Jews all over the world have been threatened and abused, blamed for the death toll in a bloody, senseless conflict for which they cannot collectively be held responsible. Indeed, Operation Protective Edge has led to such an explosion of religious tension that Mark Gardner, Director of Communications at Community Security Trust, an organization that protects Jews and their property from anti-Semitic attacks, warned that progress towards religious tolerance could be "derailed"  by the Operation. Gardner also noted, grimly, that anti-Semitic violence in Britain had risen to a near record-breaking peak since the war began 26 days ago. But the recent spate of violence against Jews cannot be slotted into the same category as Chomsky or Goldstone's writings. While incontrovertibly linked to public anger at the current Operation, the Sarcelles riots and like occurrences should be viewed in the same manner as the #HitlerDidNothingWrong Twitter phenomenon: anti-Semitism portrayed as protest, and not the other way around. This aggression can never be justified, and yet many are willing to try -- all because of the IDF's actions in Palestine. And the Israeli elite very definitely shares the blame for all this. Pusillanimous apologists tempted to call the anti-Semitic furor over Operation Protective Edge a 'one-off', or attribute it to leftover resentment from the recent, biting recession, should know that even in 2002 an estimated 62% of Americans believed that anti-Semitic violence stemmed directly from Israel's foreign policy. As Israel's wars (massacres?) become bloodier and less excusable, the violence against Jews will intensify. To any sane and reasonable person, this would seem deeply illogical; 1/5 of Israel's population is not Jewish, and the wide spectrum of Jewish opinion on the IDF's actions is almost too glaringly obvious to warrant a mention. Yet Zionism's arrogant claim to represent all Jews, a key principle on which Israel was founded, washes away these contradictions and fallacies. Hence, just as Lilienthal cringed at Ben Hecht's assertion that Israeli violence gave all American Jews "a little holiday in their hearts" , we should cringe in turn at Netanyahu's blind insistence that Israel must be recognized as a Jewish State -- and all the racist, apartheid legislation that goes with that distinction. We should cringe, also, before any attempt to personify Israel into an entity with "Jewish" characteristics (Alan Dershowitz dedicated a whole chapter in his book, 'The Case For Israel', to justifying his classification of Israel as "the Jew among nations" ). Because these assertions are at the root of the belief that all Jews support Israel, and that all supporters of Israel are Jewish -- and, therefore, that anti-Semitic violence is a legitimate form of anti-Israel protest at times like these. Should All Activists be Anonymous?